200 Million years ago, majestic dinosaurs prowled the earth eating large and leafy plants as well as each other. Volcanoes bubbled and giant beasts shrieked and wailed as they splashed in mud and chased dragonflies the size of Volkswagens. It was a thrilling epoch! That’s why YD industries decided to capture the excitement of the dinosaur era with our revolutionary new product: The Contraceptive Dinosaur Sponge! 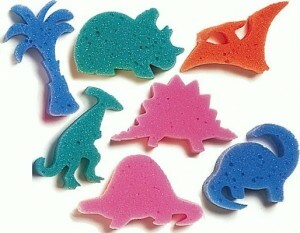 The Contraceptive Dinosaur Sponge: Expandable, squishy, and fun! Continuing in our line of innovative family planning products, our collection of specially designed contraceptive dinosaur sponges magically enlarge over the course of ten exciting minutes with the addition of generous fluids. Once engorged, the sponges can be used in a number of exciting ways: to reenact fearsome dino battles, as a paint tool for crafty projects, or as a 67% effective birth control device during impromptu Jurassic themed nookie. It is truly a revolutionary, multipurpose sponge that the whole family will enjoy. Order now! They are perfect holiday stocking stuffers or make a special mid-year treat for your child’s teacher.